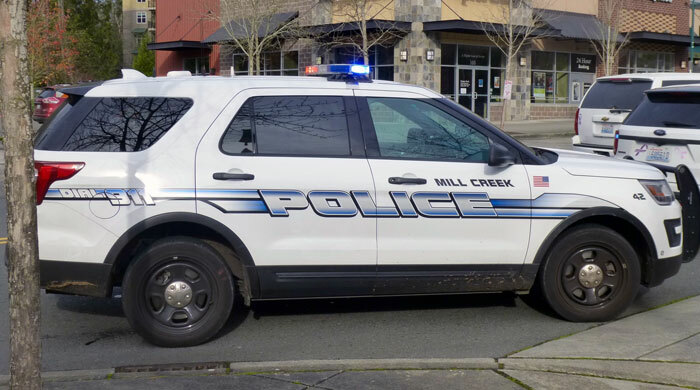 According to the latest Mill Creek Police Blotter, a total of 636 responses were reported the week of July 27th to August 2nd, 2018. 13:28:25 - 13400 BLK 33RD AVE SE: Officers conducted a death investigation near the 13400 block of 33 Ave SE. 19:45:31 - 15800 BLK MILL CREEK BLVD: Officers stopped a vehicle in the 15700 block of Mill Creek Blvd for a seatbelt violation. A 39 year old Buckley male was cited and released for DWLS 3rd Degree. 21:35:52 - 4800 BLK 132ND PL SE: Officers responded to the 4800 block of 132nd Pl SE for a report of an assault. Investigation revealed that a 39 year old Mill Creek male had assaulted his 39 year old girlfriend and her 12 year old son. The suspect left the area prior to police arrival. The male was later arrested at the residence and booked into the Snohomish County Jail for Assault 4th Degree DV and Assault 4th Degree. 18:28:05 - 13500 BLK 29TH AVE SE: Officers responded to the 13500 block of 29th Ave SE for a domestic assault. A 46 year old Mill Creek male was arrested for assaulting his 45 year old Mill Creek wife. The male was booked into the Snohomish County Jail. 22:05:34 - 3900 BLK 141ST PL SE: An officer responded to a disturbance in the 3900 block of 141st PL SE. Parties were initially separated and agreed to leave each other alone. However, an adult Mill Creek female continued the disturbance via text messages and phone calls threatening to cause physical harm to another adult female. 03:10:07 - 2000 BLK MILL POINTE DR SE: Police responded to unknown subjects dumping garbage in a driveway in the 2000 block of Mill Pointe. Subsequent to investigation of a found vehicle, it was determined the vehicle was stolen upon contacting the registered owner. The investigation is still ongoing. 09:19:57 - 14000 BLK NORTH CREEK DR: An 84 year old Mill Creek apartment resident in the 14000 block of North Creek Drive reported his home was burglarized the prior day while he was away. The victim had left his garage door partially open while he was away due to the hot weather. 11:28:53 - 3100 BLK SILVER CREST DR: A 75 year old Mill Creek resident living in the 3100 block of Silver Crest Drive reported being the victim of a computer and financial fraud involving a call center outside the United States. 20:58:03 - 13600 BLK NORTH CREEK DR: Officers responded to an illegal dumping complaint in the 13600 block of North Creek Drive. Furniture was discovered illegally dumped on city property. 21:02:25 - 13500 BLK 35TH AVE SE: Officers responded to a recovered stolen vehicle in the 13500 block of 35th Ave SE. The vehicle was returned to the registered owner. 08:07:46 - 13300 BLK 46TH AVE SE: An 82 year old Mill Creek resident reported his unlocked vehicle was prowled sometime overnight, a garage door opener was stolen. 11:41:21 - 13400 BLK 44TH AVE SE: PSO took a found property report for a wallet, which had been found in the 13400 block of 44th Ave SE. 12:00:50 - 13600 BLK BOTHELL EVERETT HWY: A 26 year old Mill Creek resident reported parts stolen from his vehicle while it was parked at his place of work in the 13600 block of SR-527. 13:53:26 - 15600 BLK MAIN ST: A local business detailed and released a shoplifter in the 15600 block of Main Street earlier in the day. The business subsequently asked police to pursue charges. 19:24:16 - 2500 BLK 132ND ST SE: Officers responded to a disturbance in the 13100 block of 25th Ave SE. A male and female were arguing. 06:19:27 - 800 BLK 164TH ST SE: A business in the 800 block of 164 ST SE was burglarized. 09:06:50 - 13500 BLK NORTH CREEK DR: Officers responded to an apartment in the 13500 block of North Creek DR for a theft complaint. A 22 year old Mill Creek man reported the theft of a license plate from his vehicle. 09:47:05 - 4400 BLK 135TH PL SE: Officers responded to the 4400 block of 135th PL SE for a Burglary report. A 31 year old Mill Creek woman reported an unknown suspect(s) entered her garage after prowling her vehicle parked in front of her home. 00:59:08 - 900 BLK 132ND ST SE: Officers stopped a vehicle for speeding in the 900 block of 132nd St SE. A 31 year old Everett male was cited and released for DUI. 08:29:17 - 14600 BLK MAIN ST: PSO took a report for a loose dog approaching a person with dogs in an aggressive manner at 14600 block of Main St.
18:31:17 - 15600 BLK MAIN ST: Officers responded to the 15600 block of Main St for a theft report. A 22 year old Everett female was cited and released for theft. 20:54:54 - 13500 BLK BOTHELL EVERETT HWY: Police took a report of a hit and run in a parking lot in the13500 block of Bothell Everett Highway on 08/01/2018. The investigation is ongoing. 21:15:42 - 15000 BLK MAIN ST: Officers responded to the 16800 block of 6th Ave W for a theft that occurred in the 15000 block of Main St. A 34 year old Lynnwood male reported his credit cards had been stolen and multiple charges were made. Investigation is on-going. Click on this link to see the July 27th to August 2nd, 2018, Mill Creek Police Blotter.